Those simplistic people, those illiterate old men and old women, who during Lent and Holy Week can be found all day in church, lived out their younger years in the education and admonition of the Lord, and understood the joy-giving mourning, which has not been understood, alas, by our scholars, who wanted to teach them, rather than learn from them. Now during the days of Lent, Holy Week and Pascha they walk with Christ, collectively following behind Him, truly, not fantastically, listening to Him say: "Behold, we go up to Jerusalem, and the Son of Man will be surrendered, as it is written of Him". They are with Him at the Mystical Supper and weep at His words, they go with Him to the Praetorium and to Pilate, together with Him they are spat upon, together with Him they are whipped, together with Him they are mocked, together with Him they are crucified, together with Him they are buried, together with Him they are resurrected. Their eyes are running like fountains, but these tears are not tears of despair, but of hope and certainty that with these are watered the entirely cool and unfading tree of true joy, the joy of the Resurrection. This is done every year. Oh! 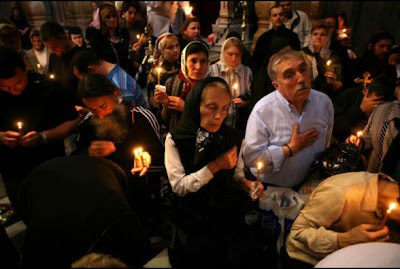 How truly faithful is the Orthodox faith of our people!